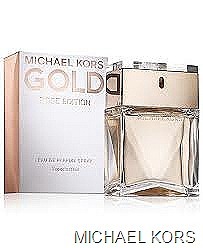 Michael Kors, the snippy, snappy member of Project Runway’s judging panel, has launched his latest fragrance called Michael Kors Gold Rose Edition. Before you jump to conclusions and pass this off to your grandmother, I have to tell you that this perfume will not remind you of a Valentine bouquet – not that there’s anything wrong with the true scent of roses. But, Gold Rose just isn’t that fragrance. Rather, it offers up a fresh floral without the obnoxious rush of knock-you-on-your-keister sweetness. Personally, I could kiss Michael Kors on the mouth because I’m so over all of those jammy, cloying perfumes that folks keep turning out. Really, who wants to smell like the bottom of a Smucker’s jar? The rosiest part of this fragrance is the pink tint of the perfume in the blocky glass flacon set off by a metal band with a slightly pinkish hue. You’ll find notes that include tuberose (not a rose at all), peony, gardenia and pink pepper. The fragrance does feature hints of rose centifolia (cabbage rose) and raspberry, but they don’t get in the way of the fresh scent of Gold Rose Edition. Available in a 3.4-ounce spray for $98, 1.7 ounces for $78 and 1 ounce goes for $50 online, Neiman Marcus, Sephora and Macy’s. Have you tried it? If so, let me know what you think. Trish, check it out the next time you’re out and about. It’s really pretty nice and fairly clean. But, keep this in mind: A little goes a long way. Spritz lightly at first.